The Magazin "Tyzhden.ua"discussed the elite genre of enamel painting, its history and the present with enamel painter from Kyiv, one of the creators of the Collar of the President of Ukraine, the author of the works for the British Crown and the Royal Family of Serbia, Volodymyr Vanin. Enamel painting, just as jewellery, combines artistic and technological components. While one can learn to draw in art school and art academies, where and how could you learn the techniques of working with enamels in your youth? I graduated from the Fedoskino school of miniature painting, located near Moscow in Soviet times, more precisely, one of its faculties, where I learned the work of art enamel. I heard that that this school is closed now. The faculty, I told you about, was formed on the basis of the Rostov factory, founded in 1918, which is now called "Rostov Finift" (art of enamel work on metal). In Soviet times, this factory made very special products of mass consumption, and it also established educational workshops, which provided an intensive training course. That's where I studied. Talking about consumer goods with enamel inserts, these were different decorations; however, people bought them very well, because it was a kind of a visiting card of the USSR. Such enamel inserts had very simple compositions, like a small flower arrangement. Nobody worked after graduation in the workshops of the Rostov factory. There is nothing complicated about teaching someone to draw flowers on enamel: a few months – and the student may do this. Because they dealt with very simple, decorative compositions. This is how they taught us: they gave us a reproduction, and said: "Make a copy." They made us exhausted, actually forced us to work. We were forbidden to work using oil painting technique. It turned out that it was precisely the aspect where our teachers were not tyrants: the watercolour painting technique is very similar to the technique of creating the enamel painting. I have not heard about any educational institution in Ukraine that would allow receiving the specialty and the technical skills required for the master- enameller. I have an artwork called "Struggle for a Win-Win. Self-portrait." It depicts two persons - Harlequin and Piero. Harlequin is an image of an adventurer, a provocateur. I think, I may choose which work to perform. Material gain is not that strong incentive, because I could earn money in an easier way. Let's say, by doing a couple of artworks requiring less time and efforts. And if the proposed work contains a certain challenge in itself, generates interest, I feel an excitement of a master – I will go for it. The task should be complex. I am easy to play “you wouldn’t dare”: if someone says that something is impossible to make in the enamel – that's interesting. It often happens that I discuss these difficult tasks, ideas of new series of works with my art manager, Yulia Gnat. 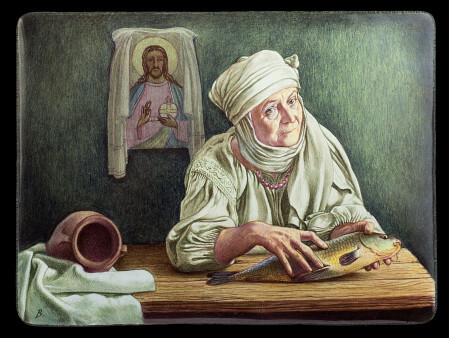 For example, the idea is to create a series of works on Ukrainian themes in the style similar to Bosch and Vermeer. This series opens with the miniature enamel "If the fish had the voice it would sing". In the summer of 2016, this artwork was exposed at the annual exhibition in Wales (United Kingdom), organized by the Hilliard Society of Miniaturists, where it was awarded with The Sue Lee Award with the "Tudor rose" honour. In December 2016, this work was exhibited at the 83rd Annual International Exhibition of Fine Art in Miniature in Washington, DC. Unlike other artists, or book illustrators, I never know what will be the output, after I pull the miniature out the glazing in the stove. Therefore, there is always a certain risk. Does the art technique, in which the author works, imposes an imprint on the way in which he picks up plots of his works? How to distinguish that we are looking at a hand-made painting on enamel? It depends. Sometimes it's about the complexity of self-expression, and sometimes it is about colour. When creating an enamel miniature, I want to make sure that the layers of enamel are as few as possible. Because each layer is a risk. The point is not in the image, but in compliance with the technology, so that the image was not covered with blisters or cracks. Again, we must take into account that it is a manual work, and there is a possibility of some small deficiency. I’m talking, for example, about enamel inserts on orders, which at times have enamel cracks that did not occur, for example, by impact, but were obtained during burning of enamel in the oven. This is a peculiar sign that we are dealing with manual work. If you look at the decal on the cups, then the paints used there are the ones I use in my work, but it is mechanized work printed on special paper that burns out when burning the item in the oven. I make my artworks on copper plates. This is a soft metal. Of course, you can use high-quality gold. These two metals handle the enamel very well. The silver is a bit worse to use for this purpose. Now I am talking about the armature, that is, my special board or canvas, if you want, to create an enamel miniature. I put the enamel in a powdery way on a copper plate. That is, to start, I rub it in a special mortar, and then, I sprinkle the copper plate with it like a powder of sugar. After I made one layer, I burn it in the oven. Then I make the second, the third. As many as needed. There are different enamels, different number of enamel layers. It depends on the effect I need. A rigid heraldic image needs one type of enamel, and a watercolour portrait or landscape needs a completely different type. There is always the question - what effect do we want to have on the enamel image? Sometimes you need it to be matte, sometimes brilliant. It depends. When I worked and lived in Serbia, I had a lot of orders for the clock dial. It happened that the customer had an old, magnificent clock with a working mechanism, and the dial was either broken or pricked. And what should the owner have done with such a clock? In life, when you look at the artworks, in particular paintings on the enamel, they are much better and more exciting than in photographs. A photo does not show, say, the opal effect of enamel, used in a particular work. When you need a graphic and a detailed drawing, the enamel is much tougher. When you create a image, do you draw on the enamel immediately, or create a few previous sketches on paper? There are almost no sketches of my works. I allow myself to make paintings immediately. Sometimes, of course, I can make a small watercolour sketch for myself. But talking about painting in whole – I make a watercolour painting quite often. My last watercolour was the ancient Syrian city of Palmyra. As soon as I finished this order for artwork, the war started there. When it comes to jewellery, jewellery with enamels is a business card of Georgia and Morocco. How many basic enamel working techniques exist in the fine arts field? Which of these are inherent to Ukrainian territories? I use such techniques, as: enamel work on metal or enamel painting. There is also perforated enamel, but this technique is mostly for jewellers use. We may say that this is one of their everlasting techniques. There is also stained glass enamel. It is worth mentioning the works of Rene Lalique, a French jeweller and a master of glass art who worked in Art Deco style. One of his artworks was made like metal dragonfly, and each section of its wings was filled with translucent enamel. It's very hard to do such thing in the oven. But this was, say, an adornment for Sarah Bernhardt. As you know, such adornments are unique, because it is impossible to make a lot of them. Have such techniques been in Ukraine, say, until the nineteenth century? Yes, they have been. Talking of perforated enamel – this is a very old technique; and talking about enamel work on metal – Ukrainian craftsmen also did it. Their artworks of XVI-XVII centuries came to our time. I remember that the characteristic feature of the works of ancient Ukrainian enamellers was the use of brown colour in a palette. There are quite a lot of magnificently decorated church books in the collection of Kyiv Lavra museums, which have enamel cartouches inserts among decorative elements, mainly with images of biblical subjects or saints on them. This gave impetus to the development of Ukrainian enamel. They moved from the decoration of church books and panagia of high Church officials to the decoration of enamels of state orders. In the Russian Empire in the time of Peter I, there was a single highest award established. It was the Order of St. Apostle Andrew the First-Called. There are not many of such orders and order chains to them. In the middle of the Order Star there is an enamel insert, which depicts the crucified apostle Andrew, and the Order chain consists of interconnected units with enamel inserts. It is not only about Russia, but also other countries: very often the highest orders of these countries have enamel insertions. People still make the orders with art enamel in their decoration. Of course, there are very little of them. I often had to develop the design of such orders from scratch. I mean the metal design and central enamel insertion. In particular, I worked on the creation of a collar (neckline) of Ukrainian presidents. The Ukrainian collar has seven enamel inserts, which is well thought, because it is about seven Ukrainian lands. Heraldist Oleksiy Rudenko and a team of Lviv jewellers were involved in the development of this insignia. I made the enamel insertions for this chain. Why do masters- enamellers, for the most part, copy the works of others, and do not create their own original artworks? Is it because of the lack of ideas? There is no special need in this. Unlike a gigantic painting canvas, the enamel miniature is not the area for giant imagination on a philosophical or dramatic theme. It's about small things – orders, portraits. As for me, the portrait on the enamel is just that. Do not think it's that simple. No way. This year, within the framework of the exhibition of the British Royal Society of Miniaturists, a collection of portraits on the enamel of the XVIII-XIX centuries was demonstrated. If you look at these works, you’ll find even the ears attached to those images to carry them in chains, as modern pendants. Many crowned persons, and in particular the rulers of the Russian Empire gave their portraits on the enamel as a statement of their kind attitude to the courtier at that time. There were no photographs then. Fashion has spread among wealthy strata. In particular, girls from wealthy families loved to give their portraits to their admirers, including the military. As a rule, these were enamel portraits, that was expensive and a unique thing. There were also watercolour miniatures on the polished bone. My art manager, Yulia Gnat encourages me to some development, that is, an increase in the number of my original works. And here's one thing I should tell. The technology of creating enamel is difficult, requires painstaking work. Therefore, the artistic expression in this technique, its completeness and the balance between the author's ideas and the requirements of technology is difficult. Every mistake in the art enamel may spoil everything and make you start work from the very beginning. This is not watercolour or oil painting, where error correction is a relatively simple matter. A good enameller can be a good artist, but a very good artist will never paint the way we paint on the enamel. Another thing: the artistic expression in enamel technique creates a 3D effect. The question is how to work with light. Not every oil painting is a pictorial art. Pictorial art is where there is work with light. Going back to the theme of creating a image in the technique of enamel art, the technique of work with light is completely different here. In enamel art, the light is not surface but the one that goes inside the image. I do not have white paint at all. If I have to make a glare, I create a peculiar background for this. I have to add a layer over the layer. Everything is practically the same as in watercolour – we don’t use a lead white paint or etc. The art technique determines the mode of thinking of the artist. Interestingly, there is difference between the language of the artist painting with oil and watercolourist, his actions and way of thinking and the order in which they create an image. 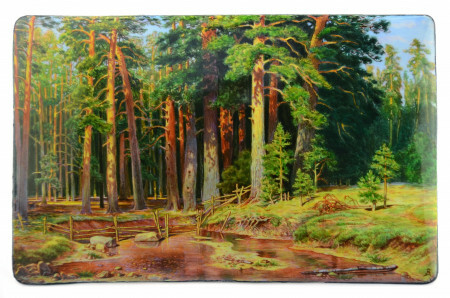 If I create a reproduction on enamel, and moreover, my original work, I make it in layers. 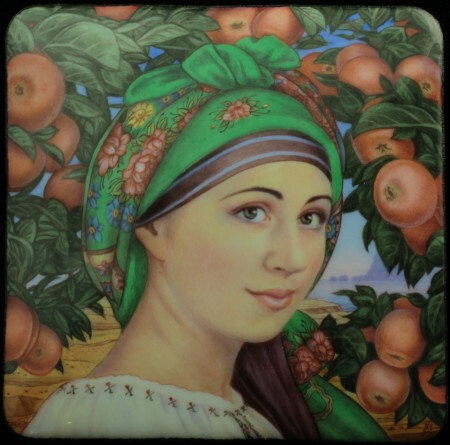 One of my works is "Traditional Ukrainian woman with a peninsula in the outlook". There is another layer - political – behind the woman's portrait. The attentive eye can see the image of the rocks of the Kara Dag volcano, the visiting cards of the Crimean Koktebel. I made it for purpose. These are the places where I spent my childhood. Let’s talk about technique of painting again. When you write a image with watercolours, it is logical that you begin with the distant plan, and then straighten those things that you want to portray on the foreground. It is the same with the enamel, but there are nuances: certain colours are burnt out at a temperature of 800-900 °C. Therefore, I start with yellow or orange paints, because they are the most temperature-proof, and they must be burnt the very first. You may do it in the end, but all other colours will burn out. It should be added that under the influence of temperature in the oven, the paints change their colour. For example, practically black paint after burning becomes a delicate pink colour. This math you should keep in mind too. You've lived and worked abroad long enough. Why did you come to Ukraine while you could choose any place in the world? I had been living in Serbia for 9 years. And I always wanted to live in the Crimea, because I was born in Theodosius. Then the Peninsula was annexed. After that I never was at home. I did not visit Crimea because of the principle. Earlier it was difficult to get the train ticket. Now checkpoints separate us from the Peninsula. I have a feeling that someone is trying to take away my homeland, and I am very angry at them. One can go to other countries, in particular Western Europe, and stay there to live. I was offered to teach at Hague, but I refused because of the problems with the language. And no one will understand the technology due to linguistic divide. How many societies of miniaturists, in particular, enamellers are there in the world? Is there at least one such in Ukraine? In the Great Britain there are at least two. This is the British Royal Society of Miniaturists, which has existed since 1896. At first it was called the Royal Society of Miniature Painters, Sculptors & Gravers. The first exhibition of this organization was held in 1896 at the Contemporary Art Gallery in London, and was dedicated to modern miniatures. King Edward VII granted the society the Royal status in 1905. The second society is the Hilliard Society of Miniaturists in Wales. There are many techniques of creating miniatures. But when it comes to enamel, there are only two masters for the whole of Great Britain who work with enamel at a decent level. In particular, Gillie Hoyte Byrom, who works on gold. Certain elements of the images created by her contain those visual and light effects produced by this metal. This master creates portraits of kings, aristocrats, and also less well-born persons. But she does not make any landscapes or other images. In the UK and the United States, some societies of miniaturists create their own environment and pool of people, in which their art develops pretty good, including in terms of sharing their techniques. In our country, there is almost nobody to establish such societies with. In Russia, there are masters who work with enamel, but they create items for church use of medium quality. The revival of the national technique of enamel painting is hindered by the lack of places where such technique could be mastered. Did you have an idea to create a small studio of enamellers in Ukraine? What challenges can you face when doing this? To make the enamel miniature is one kind of work and to teach another person to create it – is a completely different thing. To have the result, you have to commit yourself to a teaching process. You need to understand the person well, learn to communicate the information in a clear way. You need to have patience and faith in the future result. You may not be able to teach a person, and there are no guarantees practically. I mean, this is uncertain, very risky thing. Although, I may not say that there was no thought or conversation with me in order to create my own studio to teach enamel painting. But there is a question of premises, equipment. You need to be an economist in this regard. In addition, the process of teaching to work with art enamel should begin with children, preferably those who studied in art school. Going back to the subject of the plots of your original work on Ukrainian subjects, would you embody the events of the Revolution of Dignity or the current war? Is it difficult to do it in the genre of enamel miniatures? Wide dramatic canvases, such as Maydan on fire dated February 18, 2014, are not for enamel miniatures. But to make the portraits of our heroes on the enamel, in particular the Heaven's Hundred Heroes, would be cool. At least the most famous of them – Nigoyan, Zhisniewski, Verbitsky. You can paint demonstrations, fire, smoke on miniature, but believe it will not look spectacular. Experience of foreign exhibitions has showed that seeing work on enamel on a photo is not enough. The viewer should immerse in it, to be personally attached to work. Only then you can understand how the work, created on a certain plot and in a particular technique, affects the audience that sees it. The enamel miniature is an elitist, unique thing that is connected with aristocracy, good taste. So as the modern Ukrainian politicians could appreciate such works, they must at least find out what the thing is about, and in what historical contexts it brings the person who has it in his/her private collection. It is clear that Pshonka or Yanukovych did not have such things in their collection. The image on the enamel, in particular portraits, is something that will not disappear, but will be forever kept by the family members. Such things belong to the class of family values ​​and are not for sell. The enamel miniature sustains colour and image almost forever. Michelangelo frescoes pile up over time, they need to be restored. Enamel is a glass. If nobody breaks it, the life span of the miniature enamel painting is almost limitless.